Another, equally valid, school of thought on composition insists that you reduce your subjects to shapes. The link between geometry and some underwater subjects can be very tenuous at times, but some general observations can be made. The first, most obvious shape you have, and the one shape you are stuck with, is that of the picture frame. The ratio of the sides differs between cameras (35mm slide frame is 3:2, TV 4:3, HDTV 16:9, 4X5 film 5:4). How comfortably your subject sits in it will depend on its shape and where you position it. 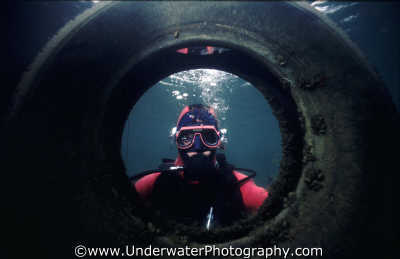 Circles are a common shape in nature and are encountered underwater often, from urchins to portholes. Circles are very stable shapes, pleasing to the eye, and encourage the eye to wander over them. Unfortunately, circles are also incredibly boring, and don't sit happily in the rectangular 35mm frame. Arcs, such as Snell's window occur naturally quite often too, and lead the eye along in much the same way as circles (but are more dynamic than circles). 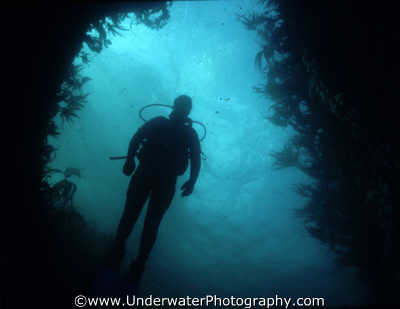 Ovals are also very common underwater. If you turn a circle on its side, it becomes an oval (and it's not quite as boring). Ovals certainly sit in the frame better than circles do. Let's take a practical example of turning a circular subject into an oval to improve its appeal. A crab viewed from above makes a pretty dull picture but, shift your viewpoint to almost head on and most people would agree it sits in the frame a lot better. Angular shapes Squares and oblongs are also stable shapes and will sit comfortably in the frame. Not many underwater subjects are this shape however. In fact, you must stretch your imagination to come up with any straight lines underwater except of course, on wrecks (see chapter 8).